Thanks mom, for the fabulous indie shirt and slouch brown boots for Christmas! Love 'em! And earrings are from...I don't even remember where. I got them in high school...that's all I remember about that. And don't forget to cast your vote on whether or not you think I should include jewelry in the challenge! 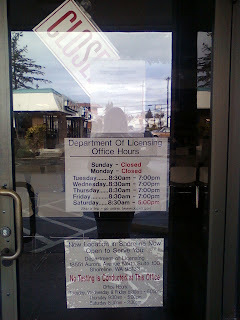 it was closed. On Saturday...for MLK Day. Think they should have put that on their website? I do. Well, as Matt put it, "The worst thing that happened was we got to spend more time together." We then headed over to the mall to find a 2010 planner when I spotted a Nordstrom Rack across the street. Now before you get all uppity, I know I started this whole thing to go through my wardrobe completely but I never set any rules on buying new clothes! That being said I did find two pairs of jeans for super cheap that both actually fit me without looking like a soccer mom or a ghetto fabulous chica and I did purchase them. This challenge wasn't meant to guilt anyone into never buying anything or doling out tons of money to charities. It was meant to make me more aware of what I have versus what many people don't, and put money aside towards a cause while hopefully bringing your attention to it as well. If you think I've abandoned the cause by buying jeans I'm sorry. Hopefully, though, you'll forgive my lapse of strength and my need for the staple of American wear. That being said, the charity spotlight today goes to Compassion International. My Aunt Wendy and my best friend Charissa both sponsor children through Compassion and reminded me right away to mention this great organization. Known primarily for their ministry of sponsoring individual children, Compassion also extends aid and relief to disaster regions like Haiti. With personnel already on the ground they are able to coordinate efforts quickly and efficiently. When I was looking them up on Charity Navigator (they have 4 stars, by the way), I saw a news article from the Denver Post that one of their contractors is still missing. To read about the latest happenings in Haiti with Compassion you can read their Haiti blog. To donate to Compassion International, click Here.